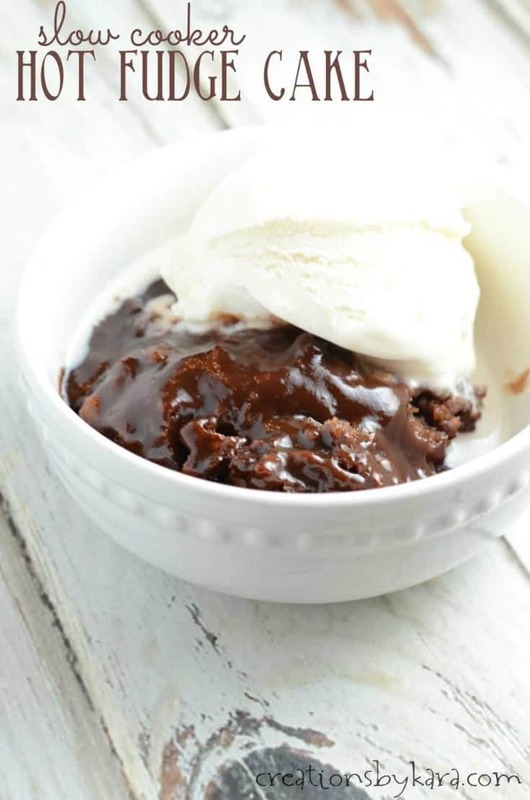 This rich and absolutely scrumptious Hot Fudge Cake can be made in the oven or a slow cooker. It makes its own hot fudge sauce as it bakes! 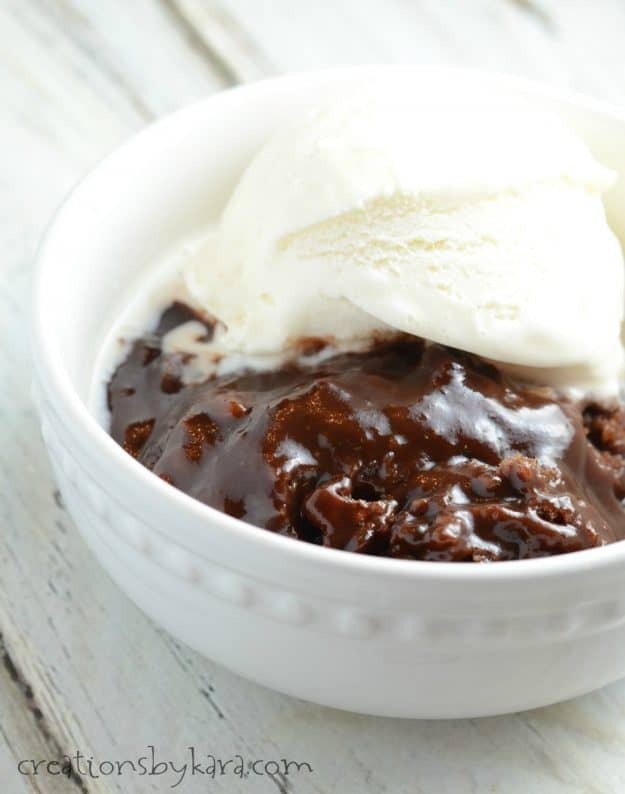 I got this wonderful recipe for hot fudge cake from my mom. 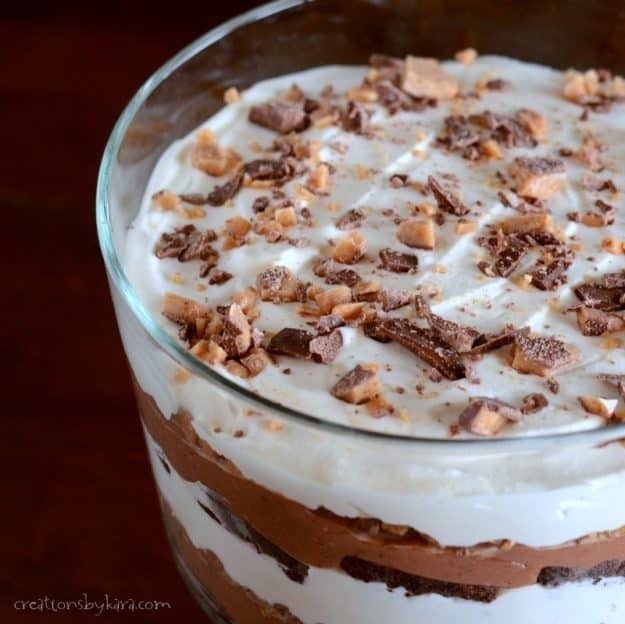 It was a favorite dessert at our house and I remember having it often as a child. We all love it! One year when my mom asked my little brother Matt what treat he wanted for family night, he told her “Water Brownies”. None of us had any idea what the heck he was talking about. We couldn’t figure it out, so she just made something else. A few weeks later, she made this dessert. When Matt saw her pull this out of the oven, he exclaimed excitedly, “Yay, you made water brownies!! !” I have called it that ever since. It’s simple to make. You spread the batter in the bottom of your pan (or slow cooker). Then you sprinkle a brown sugar/cocoa mix on top. And here’s the reason why we call these “water brownies”. You pour hot water over the sugar mixture. No stirring. 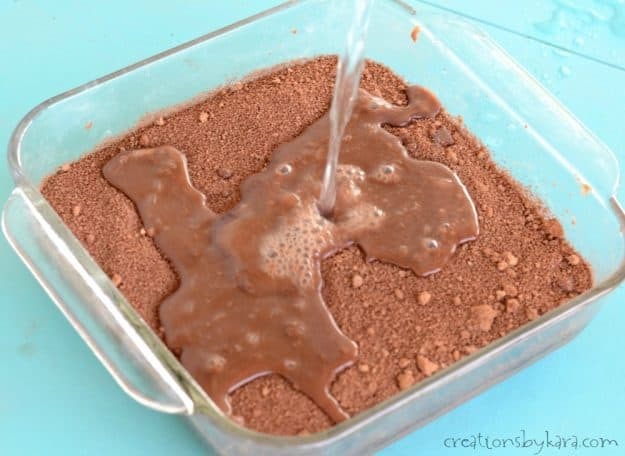 It will magically mix with the brown sugar and cocoa and sink to the bottom to make a decadent fudge sauce. Cool, right? No matter what you call it, it is sure to become a family favorite at your house too. It tastes fantastic. It makes its own hot fudge sauce. It is economical. And it is super easy to make with ingredients you probably already have in your pantry. You must serve it with ice cream though, or the dessert police will come to your house and haul you off. I’ve been making this for years in the oven, but just found instructions for making it in the crock pot. I’ve tried it, and it works like a charm. I am including the instructions at the bottom of the recipe. Stir together dry ingredients in a mixing bowl. Add milk, vanilla, oil, and nuts. 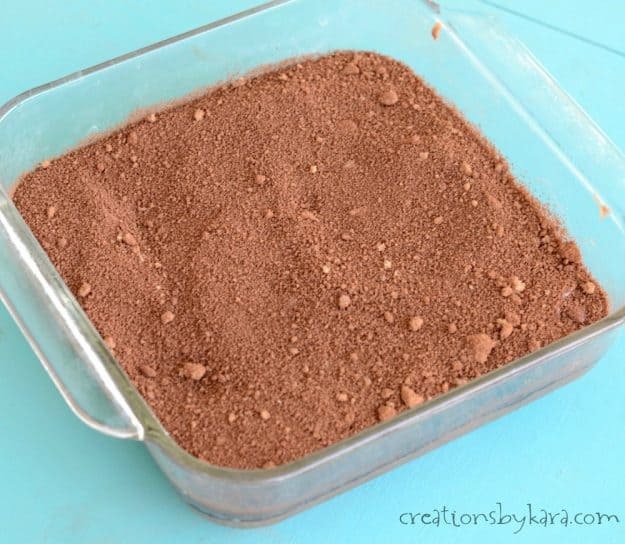 Stir till well blended and spread in a greased 8″ square pan. Mix brown sugar and cocoa and sprinkle over the top. Pour hot water on top- do not mix in! Bake for about 40 minutes at 350°. Serve warm with ice cream. Crock pot instructions: Spread batter in a well greased 3 1/2 quart crock pot. Bring to a boil the hot water, brown sugar, and cocoa. Pour over batter in crock pot. Cook on HIGH for 4 hours. That’s it! 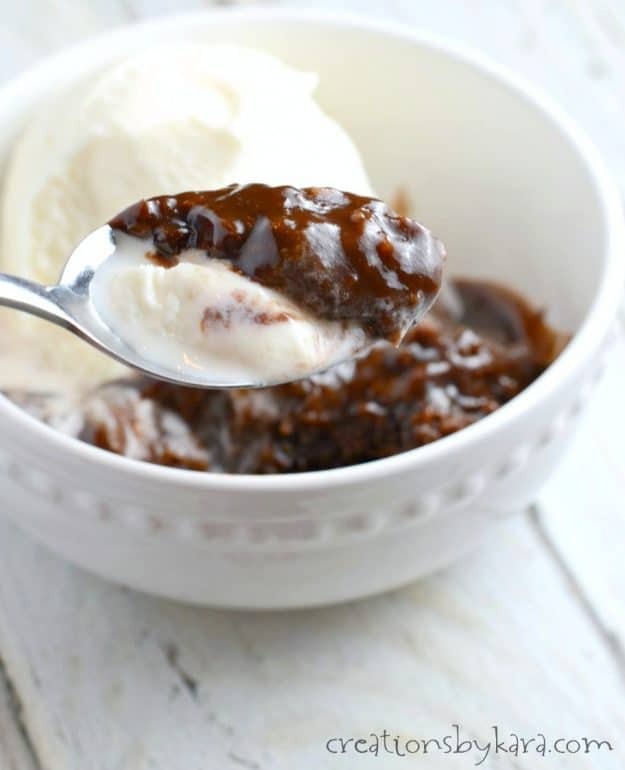 Hot fudge pudding cake that makes its own fudge sauce. Can be made in the oven or slow cooker. Stir together dry ingredients. Add milk, vanilla, oil, and nuts. Stir till well blended and spread in a greased 9" square pan. Mix brown sugar and cocoa and sprinkle over the top. Pour hot water on top- do not mix in! Bake for about 40 minutes at 350°. Serve warm with ice cream. Crock pot instructions: Spread batter in a well greased 3 1/2 quart crock pot. Bring to a boil the hot water, brown sugar, and cocoa. Pour over batter in crock pot. Cook on HIGH for 4 hours. That's it! -If you are a true chocoholic, you can add chocolate chips to the batter. -My favorite way to serve this is with pecans in the batter, and vanilla ice cream. So yummy! This recipe is suspiciously similar to a recipe in A Hershey’s Chocolate cookbook. 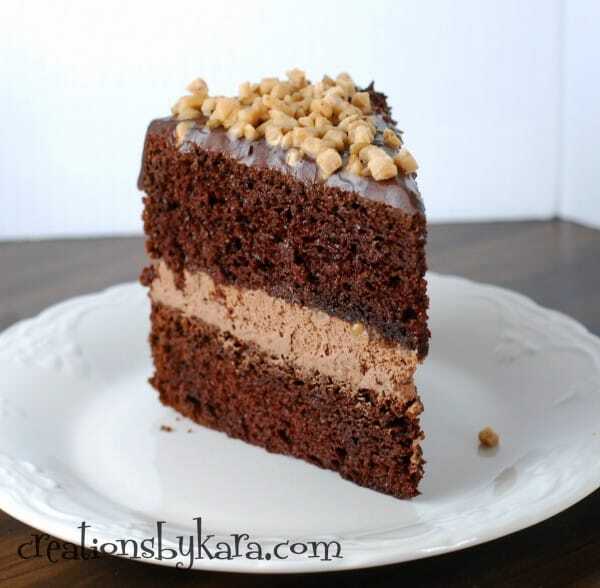 The original recipe calls for 3 Tbsp of cocoa in the cake; 4 Tbsp in the topping mixture. You’ve also added an extra 1/2 cup of Brown sugar to the topping and replaced butter with oil in the cake. While it’s ok to adapt a recipe to your taste, For those who think it’s too sweet or the cake isn’t setting properly, I would revert to the original measurements. 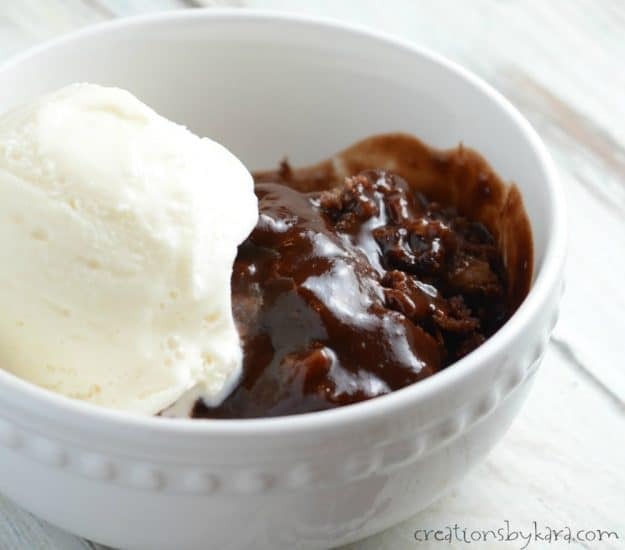 Kara, you should also give credit to Hershey’s for the original recipe, known as Hot Fudge Pudding Cake. Thanks for the tips Theresa. I got the recipe from my mom over thirty years ago, so that could be why her ingredients are slightly different from the Hershey’s recipe. Since I got the recipe from a dog-eared recipe card in my mom’s file, I’m going to stick with giving her credit. I have no idea who she got it from, but she didn’t own a Hershey’s cookbook. Tried to do this in the oven tonight. It’s been in there for a bit an hour and is still no where close to being done. I don’t really know what went wrong. Followed to recipe to a T… Any help/suggestions would be greatly appreciated. Jamie, I’m sorry to hear it didn’t turn out for you. 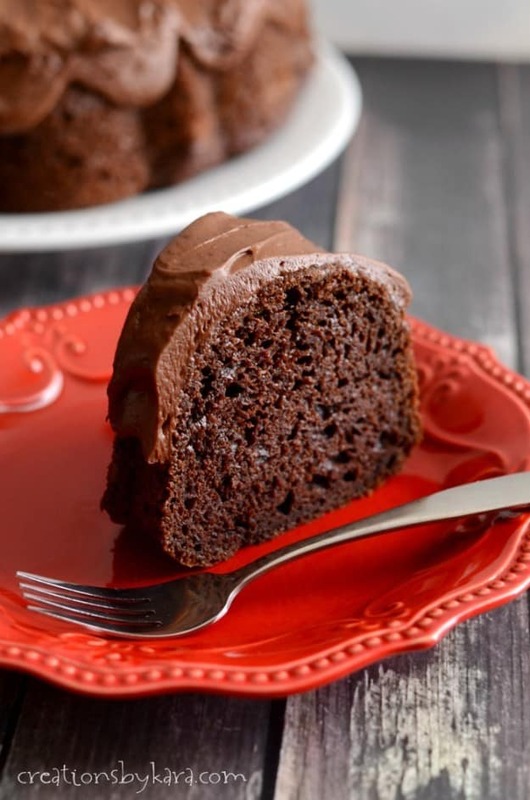 It isn’t a regular cake, so it is meant to have a liquid layer at the bottom. But the brownie part should be set up. If you followed the recipe/pan size exactly and it still didn’t get done, I’m not sure why. Maybe your oven doesn’t cook quite hot enough? I have two ovens, and they bake totally differently. It can be frustrating for sure! 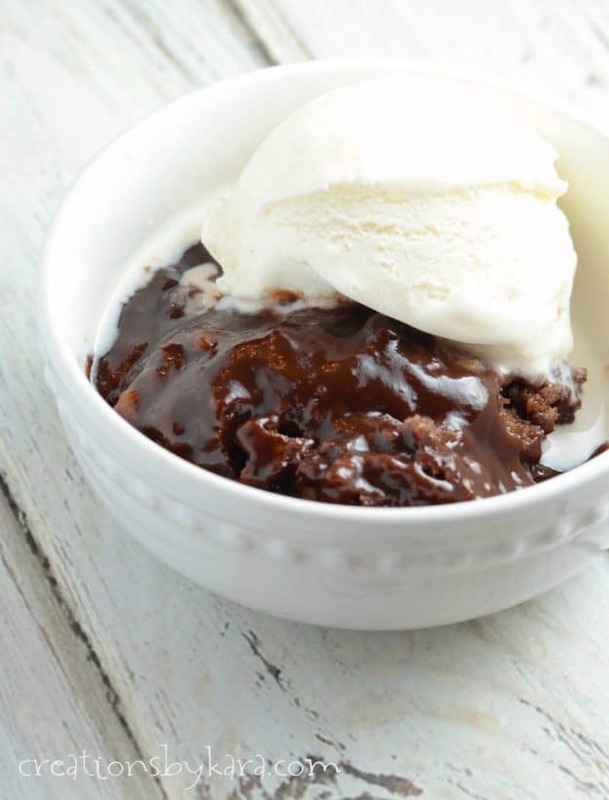 This recipe doesn’t use a brownie mix it is made from scratch. And unlike brownies, there are no eggs. I found this on Pinterest and made it the other night and I’m not sure if it turned out right. The cake part came to the top and the sauce was on the bottom. Also the sauce seemed rather watery too me. Is it 1 & 3/4 cup water or 1 to 3/4 cup water? I also cooked this in the crockpot and it burnt after a few hours. When you double the recipe, do you use a 9″ x 13″ pan? Yep, a 9×13″ works just great! This was always my families all-time favorite recipe! Vanilla ice cream was a requirement not an option. And the fudge sauce was magically made. Anxious to try it in my crockpot for sure. I agree, vanilla ice cream is a must!! Next time i’m making it on low, or in the oven! either I did something wrong or this isnt very good :(. Should the cocoa be sweetened or unsweetened? Sorry it didn’t turn out for you Dawn. It should be regular unsweetened cocoa powder, like the kind in the brown Hershey can. Is that what you used? Juliann, it serves about 8-10 people, depending on serving size. When you double the recipe (for the oven) do you double the water mixture as well or does it become too runny? 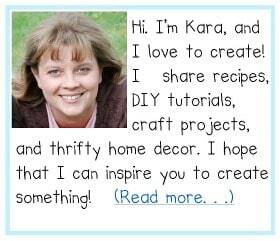 Just discovered your blog today. Have found some great recipes I definately need to try. Thanks for sharing and keep up the good work. Melinda, I’ve doubled it and baked in a 9×13″ pan for about 45-50 minutes, but I’ve never tried doubling in the crock pot. I’m sure it will take longer, but not sure how much longer. Maybe 5 hours? We’ll see what happens!! Smells wonderful! Anyone think you could use a cake mix? Lora, I wouldn’t recommend using a cake mix. The cake batter here is very thick-thicker than a brownie. I don’t think a cake mix, which is lighter and fluffier, would separate properly to make a dense cake and thick sauce. Wow, this is so great!!! Thanks for linking up this week. You are always Fabulous!! !